Notch is considered to be conserved in its role of controlling embryonic organogenesis and postnatal tissue repair. The variable strength of Notch signaling represents a highly reliable molecular mechanism that regulates cell-fate determination, and enables formation of tissues and organs from initially equivalent groups of stem cells. Likewise, we know that Notch signaling is involved with embryonic, postnatal, aged and oncogenic properties of stem and progenitor cells. The interactions between Notch signaling and other key molecular networks (e.g. transforming growth factor bone morphogenetic protein 4 and Wingless) have also been conserved in postnatal regeneration of multiple tissues, and are implicated in Notch-imposed control of stem cell responses. The mature Notch receptor (b) is produced through a furin cleavage during biosynthesis. Notch extracellular domains contain 29–36 EGF repeats, 3 cysteine rich LIN repeats and a region that links to the transmembrane and intracellular fragment. This linker region is important in preventing premature activation of the receptor and is altered in 26% of activating mutations that are associated with T-cell acute lymphoblastic leukaemia. EGF-repeats 11 and 12 (orange) are essential for ligand binding. 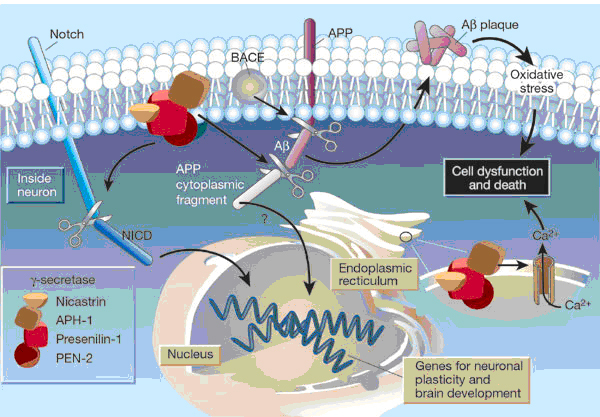 The intracellular portion consists of a RAM domain, six ankyrin (Ank) repeats and a C-terminal PEST domain. It also contains nuclear localization signals. Individual types of Notch receptor have additional protein–protein interaction motifs. depending on the presence or absence of a cysteine rich (CR) domain. The key transducer of the Notch-signalling pathway is a DNA-binding protein, CSL. DNA contacts are predominantly made through the RHR-N and BTD domains. The BTD domain contains a hydrophobic pocket that is thought to mediate the interaction with the Notch intracellular domain (Nicd). To activate transcription, the co-activator Mastermind (Mam) is required. Notch–DSL ligand binding instigates proteolytic cleavage at both the extracellular and intracellular regions of the Notch receptor. The first cleavage (S2 cleavage) is a direct consequence of ligand binding and is catalysed by the ADAM family metalloproteases- These proteases release the ligand-bound extracellular portion of Notch. These proteases release the ligand-bound extracellular portion of Notch. In S3 cleavage, release of the Notch intracellular domain (NICD) is mediated by the action of a presenilin-1- dependent gamma-secretase complex (containing presenilin, nicastrin, presenilin enhancer protein and alphaprotein [APH1]). Nuclear localization signals within the NICD direct its translocation, where it binds to and displaces a CSL transcriptional corepressor complex. 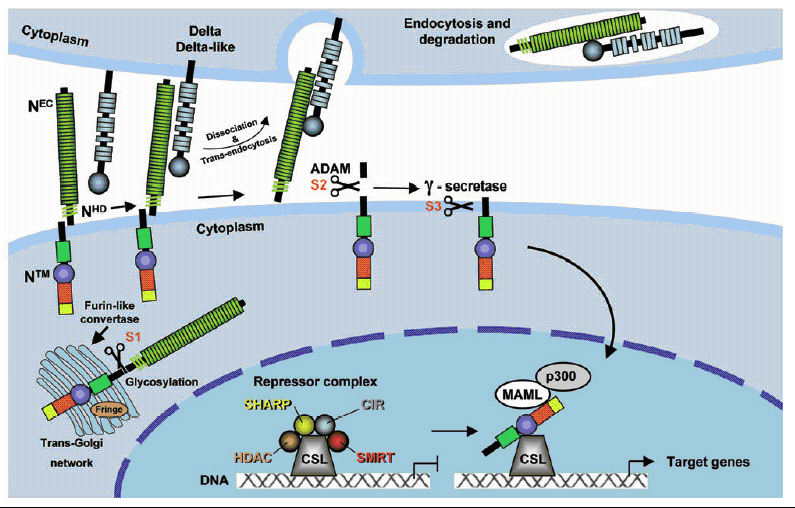 In the absence of Notch activation, CSL recruits various histone deacetylases and corepressor components. that interact directly with Notch ligands and are required for ligand activation was a striking and surprising recent discovery. Some observations indicate that regulation of ligand activity by Neur and Mib is intimately associated with endocytosis. Notch proteins have a large ECD that consists of multiple EGF-like repeats, which are sites for glycosylation. The enzyme O-fucosyl transferase (O-Fut) adds the first fucose and is essential for the generation of a functional receptor. Not only is the enzymatic activity important, O-Fut also functions as a chaperone to promote the folding and transport of Notch from the endoplasmic reticulum to the cell membrane. Lag2 (worm)) transcription factor in the nucleus and activation of downstream transcription. 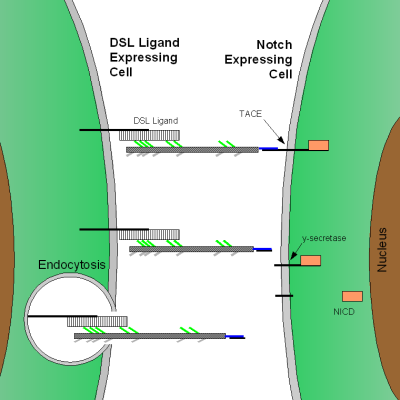 Four different Notch receptors (NOTCHs: NOTCH1 to NOTCH4) and five ligands (Jagged-1 (JAG1) and -2 (JAG2) and Delta-like [DLLs]: DLL1, DLL2 and DLL4) have been characterized in mammalian cells. These transmembrane receptors and ligands are expressed in different combinations in most, if not all, cell types. 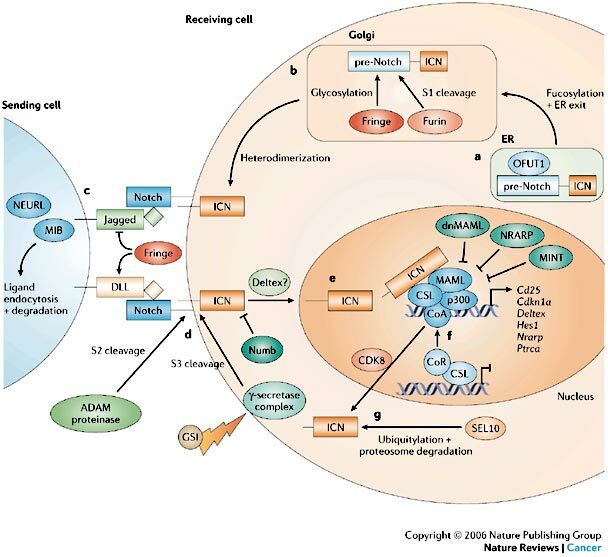 The Notch pathway regulates cell fate determination of neighbouring cells through lateral inhibition, depending on their ability to express either the receptors or the ligands. Notch family members are transmembrane receptors and developmental morphogens. In adult tissue, activation of the NOTCH1 pathway mediates context-specific functions, such as self-renewal and T-cell differentiation. NOTCH1 signalling is initiated by the engagement of extracellular portions (ECN) of NOTCH1 with its ligands, which are members of the Jagged/Delta family.